Khamvong Insixiengmai was born in Champhone, a district in the city of Savannarhet in Laos in Southeast Asia. When he was 10, he began learning Lao folk songs from a Buddhist monk named Somvang. After six years with Somvang, he continued his studies for five more years under the tutelage of different master singers and songwriters in Laos and northwest Thailand. By the age of 18, Insixiengmai had established himself as one of his country's most honored singers of the primary national song form, called lum. Lum can be either a solo narrative or in the form of repartee with a female singer. 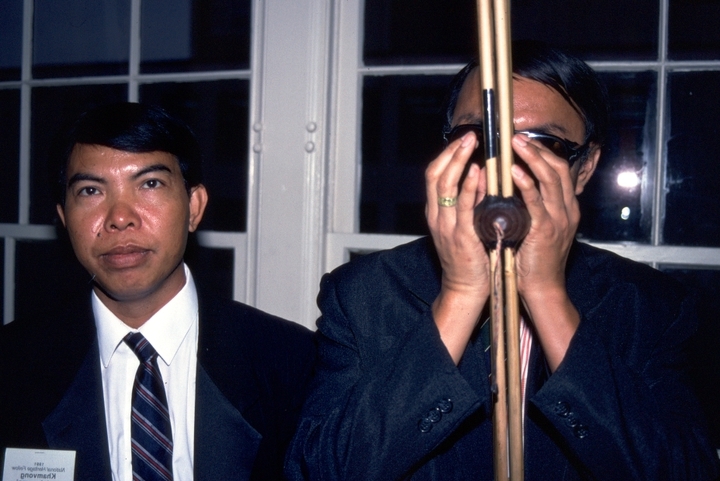 It is accompanied by the Lao bamboo mouth organ called a kean (also spelled khene, khaen, or ken), and can also be accompanied by a small ensemble that may include a plucked lute called a pin, small cymbals called sing, various drums, or a complicated wooden instrument that produces scraping, rattling and clapping sounds called a nai ngawp ngaep, in addition to a kean. Lao singing stylizations vary by region. Insixiengmai is a master of several regional genres of Lao vocal music. He is a master of poetic stylizations as well. He can improvise poetry while he sings, incorporating events of the day if he wishes. Lum, a kind of musical poetry, was traditionally part of ritualized courtship and village life during work breaks and after hours. More recently, Laotian lum has become a staged entertainment for audiences, and the poetry may or may not concern courtship. The vocal musical expression consists of various types of sung or chanted repartee involving questions, various stages of courtship or perhaps insults or double entendres. The lyrics are poetic and often improvised. They may also involve humorous and even feisty repartee between male and female singers, who often have critical interactions with an excited audience. In the past, the singers sometimes actually courted; today, professional entertainers are engaged to present the drama. Lum is quite formalized and requires trained singers and instrumentalists. Because Lao singing is so heavily based on the communication of poetry, it is difficult for nonspeakers of Lao to appreciate. In 1965, Insixiengmai started working as a folk singer for the Department of Lao National Fine Arts. 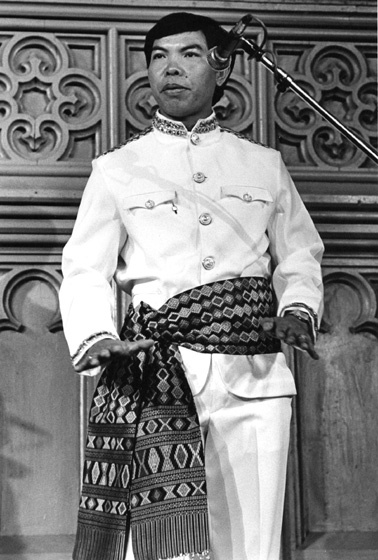 From 1967 until he left the country in 1979, he worked for the Lao Loyal Army, where he was assigned to radio programs and performing arts groups across the country. In 1979, Insixiengmai fled Laos as a refugee and settled in Thailand until he was able to immigrate to the United States one year later. On his arrival in the States, he was sent to Bowling Green, Kentucky, and in 1981 he moved to Minneapolis, Minnesota, where there was a larger community of Laotians. There, he was determined to resume his career as a singer. He made an audiotape, Music of Laos, featuring many of his songs, and started performing at local universities, international festivals and world music concerts. Over the years, Insixiengmai has devoted himself to preserving the indigenous music of Laos and has developed a broad repertoire that includes various regional styles, which tend to have their own identifiable forms of lum. The differences lie in a particular use of scale, a special rhythm or accompaniment, or dialect. Insixiengmai is one of the rare Lao singers who can compose and sing in these regional aesthetic forms. Insixiengmai, Khamvong. 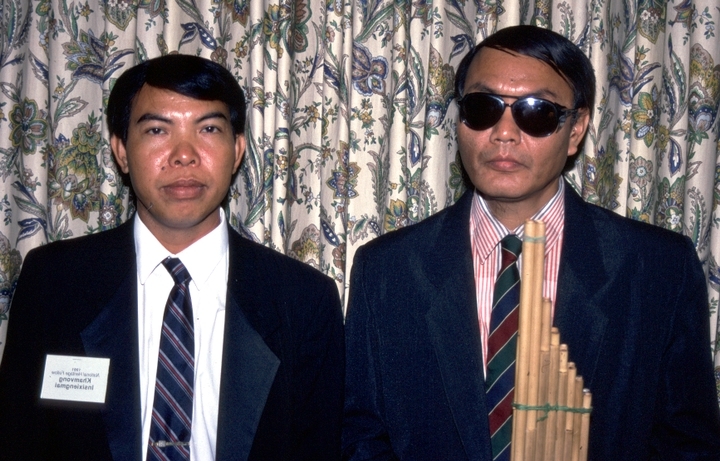 Bamboo Voices: Folk Music from Laos. World Music Institute Latitudes LT 50601.